I keep telling myself I’m going to get organized like Connie at Meal Planning with Connie, and make up a weekly menu, but somehow I never get around to it! I guess I am just too set in my ways! Connie has some really great tips on getting organized in the kitchen as well as some great recipes, so be sure to hop over for a visit and check it out! It was late in the afternoon yesterday and I needed to come up with something tasty for dinner. I literally made this up as I went, using whatever I found that I thought would go good together. I am still amazed at how good this turned out! I think it is one of my best quick-fix meals! My family said it is a definite “keeper” and they want to have it again soon! In a large skillet over medium-high heat, cook bacon until crisp; drain & crumble. Set aside. Discard drippings. 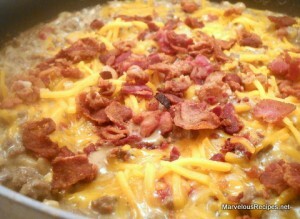 In same skillet, cook sausage, ground beef, onion and garlic till meat is no longer pink and onions are tender, about 15 minutes; drain & return to skillet. Stir in roasted red bell pepper, black pepper, water, brown gravy mix and elbow macaroni. Bring to a boil; reduce heat to medium; cover and cook 10 to 12 minutes or until elbow macaroni is tender. Stir in the ricotta cheese until well blended; cook until heated through. Sprinkle with cheddar cheese and crumbled bacon. Let stand, uncovered, for 10 minutes or until cheese is melted. Makes 6 servings. You should write a cook book! Emily, I want to do a post about your blog on my blog. Would you let me publish one of your recipes in that post? It will all link back to you. Let me know. Hey Emily, come check out The Motivation Station, the past week has been focused on menu planning and kitchen organization! YUMMY a meat lovers macaroni and cheese dish!! Hubby will love this. This is a good one. Hey, I love your new banner.